The tour, called the ACLU 100 Experience, had its debut right here in Texas at the South by Southwest (SXSW) festival in Austin. Thousands of people had a chance to walk through a small campus of hands-on exhibits and activities related to Immigrants’ Rights, Mass Incarceration, and Voting Rights, as well as connect with resources to help them stay engaged in defending the rights of all Americans. The ACLU of Texas was proud to support this initiative and help make the launch of the ACLU 100 Experience a success. Our amazing staff and volunteers welcomed guests from around the world, staffed booths, answered questions, and helped maintain the energy and buzz of the event. Throughout the three days of the experience, there were also live panels featuring elected officials, business leaders, and civil rights advocates like death row exoneree Anthony Graves who shared his story of being wrongfully convicted and about his passion as an advocate for criminal justice reform. There was also a free concert at the ACLU 100 Experience venue, featuring Padma Lakshmi, Questlove, and Rage Against the Machine front man Tom Morello. No ACLU of Texas event would be complete without a way for people to act on the issues they care about. We hosted a dedicated ACLU of Texas lounge where guests could contact their legislators about bills being debated just blocks away at the state capitol – and go home with lots of free ACLU of Texas swag! 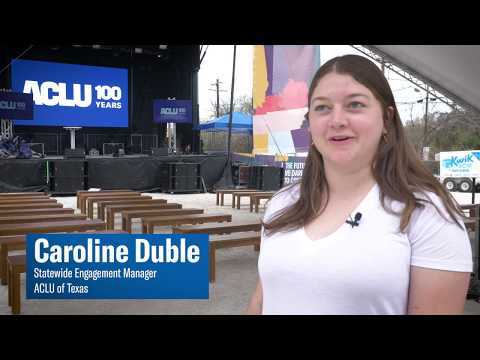 Check out the video below to see our team in action at SXSW at the first stop of the ACLU 100 Experience’s 15-city tour and find more cities and dates at the ACLU 100 website.